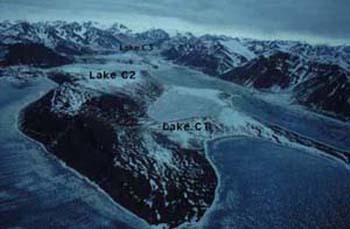 The inter-disciplinary Taconite Inlet Lakes Project was initiated on northern Ellesmere Island to examine the processes controlling varve sediment formation in an Arctic meromictic lake. This WWW - Presentation provides details of the main elements of the research carried out: meteorological, hydrological, limnological, and sedimentological. The main objective was to better understand contemporary processes operating in the watershed and hence the climatic signal contained in the sedimentary record. Such process-based studies are an essential component of paleoclimatic research, especially in regions like the High Arctic where long-term climatic data are sparse or absent. From this homepage, the following aspects of the project can be investigated. Each aspect has an overview/index page providing access to text, images, graphics and data. Throughout this presentation, most pages provide links back to the respective index pages and to this home page. Taconite Inlet and Lake C1, C2, and C3 from the air.